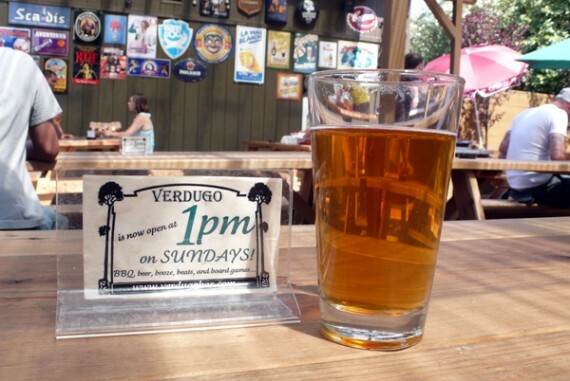 vegan-friendly oktoberfest today at verdugo bar! heads up, folks! 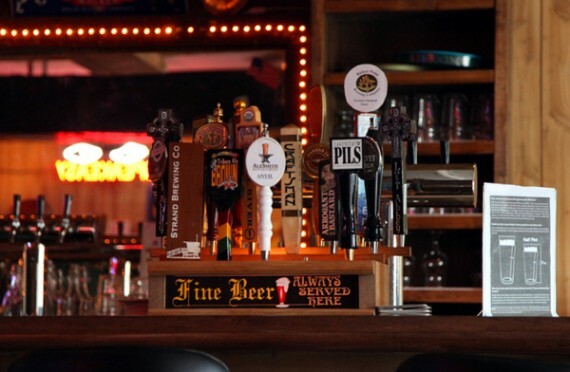 it’s oktoberfest time, and today the verdugo bar is hosting a vegan-friendly celebration with loads of german beer and food by the international sausage party. 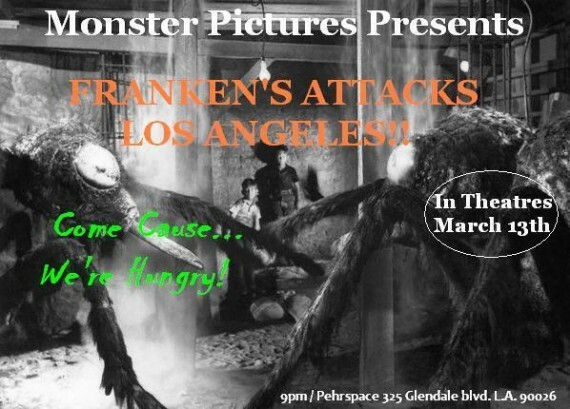 admission is ten bucks per person—it includes a commemorative stein, and the opportunity to watch a bunch of drunk people chillin’ in lederhosen. 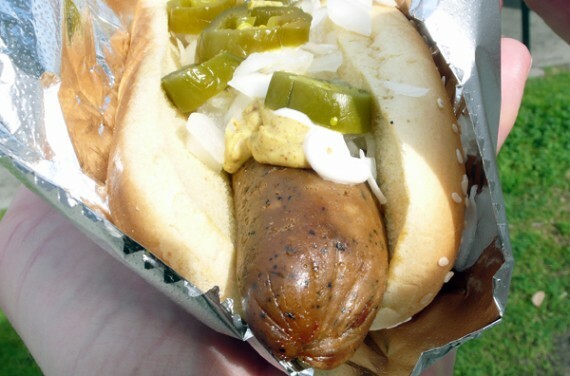 i checked with the food vendor, and they will definitely have some vegan sausages on hand, along with beer onion rings as a topping. WANT. 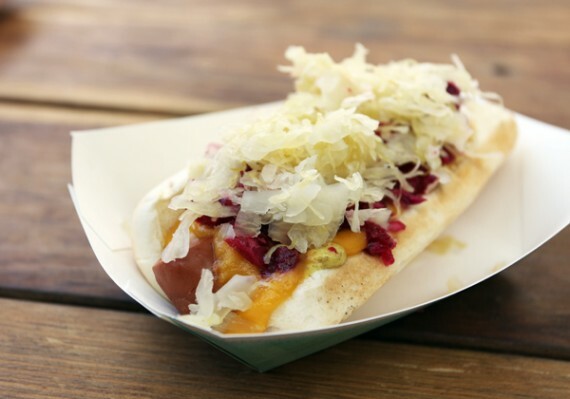 vegan oktoberfest with hot knives this weekend! 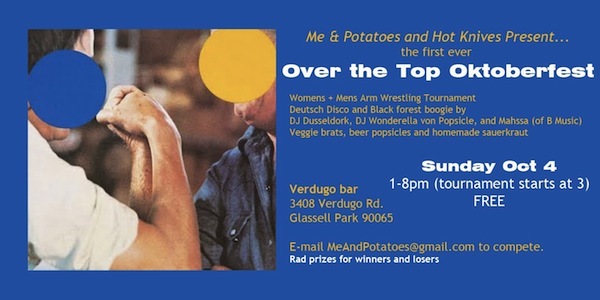 los angeles vegans, you need to drop whatever you are doing on sunday and get over to the verdugo bar because our favorite catering duo hot knives is taking over the patio again with another epic feast. we attended both hot knives events at the verdugo in august, and i can honestly say they served some of the best food that i’ve ever eaten. not just that, but the music was good, the patio was relaxing, and the beer was tasty. this weekend hot knives are coming back to host an “over the oktoberfest” celebration that will feature an arm wrestling competition and vegan german grub. 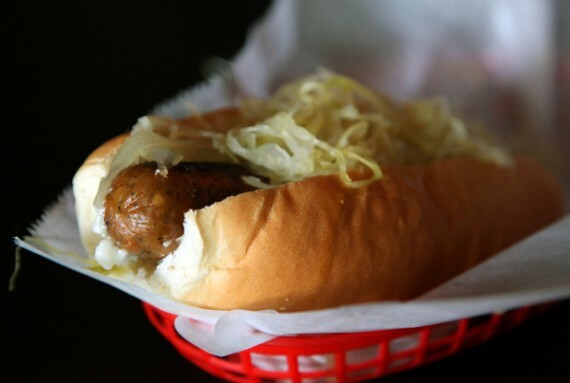 the plan for the menu is vegan soaked in Rausch beer for smokey brats, with veeg sides to choose from. 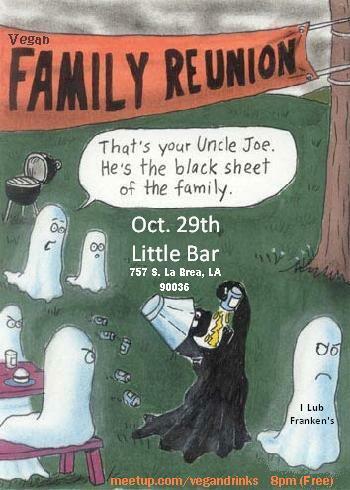 you would be insane to miss this. seriously, how often do we herbivores get to take part in the oktoberfest fun? 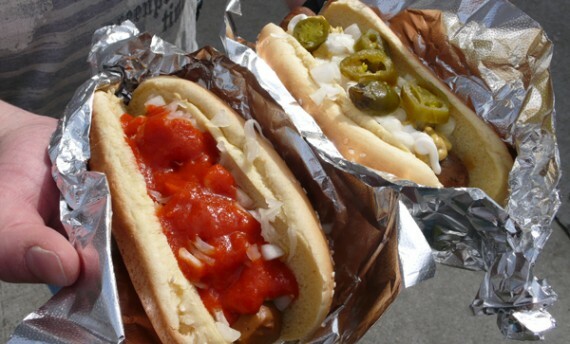 baseball and vegan hot dogs! 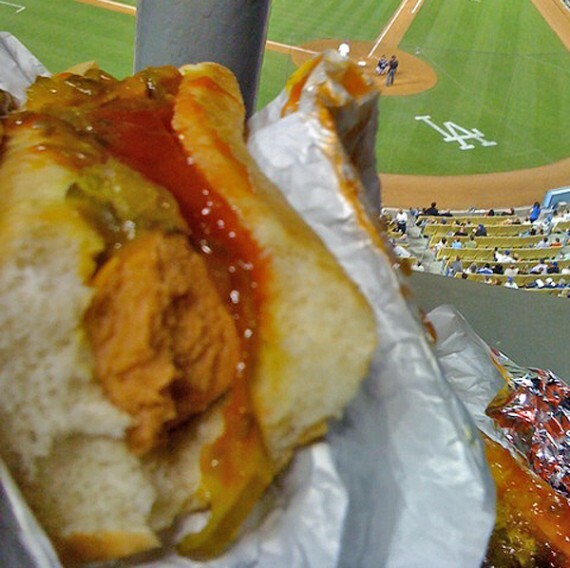 it looks like america’s favorite pastime is becoming a little more vegan-friendly, at least in the city of los angeles. 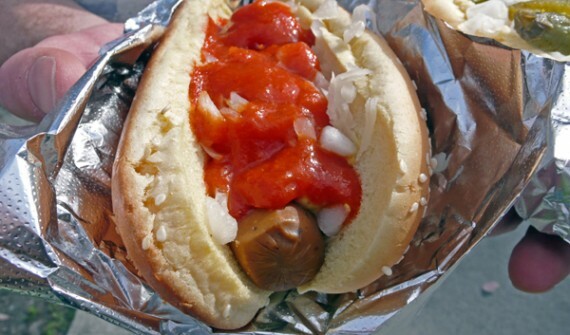 now you can enjoy a good old fashion baseball at dodgers stadium with a vegan frank in hand. 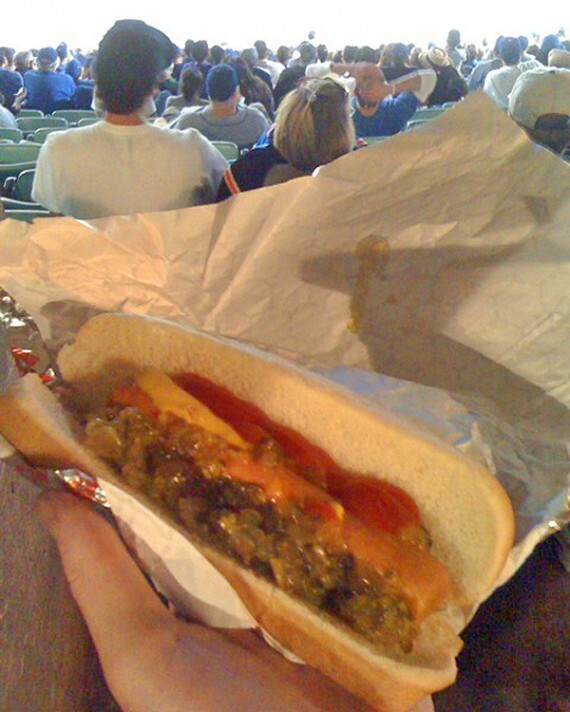 now i’m no sports fan, and i will would have never even known the stadium was offering vegan hot dogs…but luckily for you a friend of mine spotted them, tried them out, and even got some snap shots of them for your benefit. 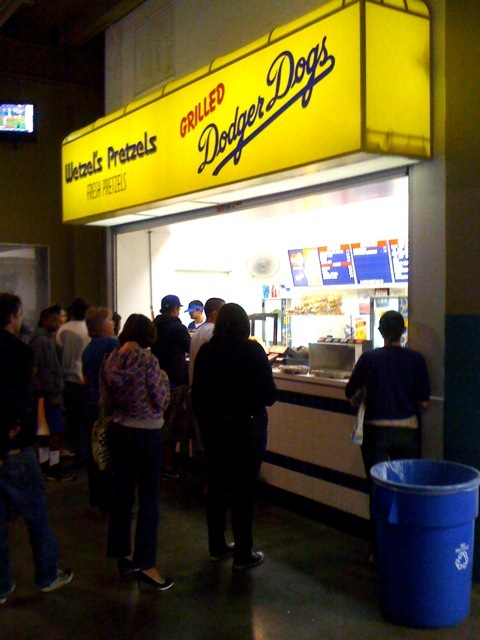 dodgers stadium uses lightlife’s smart jumbo dogs, which are completely vegan, as well as bimbo bakeries buns, which are also vegan! while $6.25 is a lot to pay for a simple veggie dog, i guess it’s pretty standard considering the fact that everything is overpriced at sporting events. now you can feel ripped off just like the meat-eaters…it’s only fair. 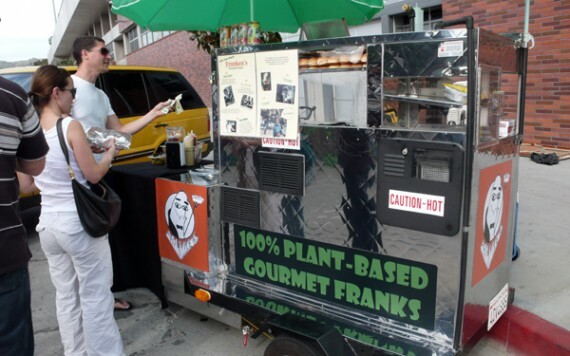 baseball is way cooler when vegan hot dogs are around! 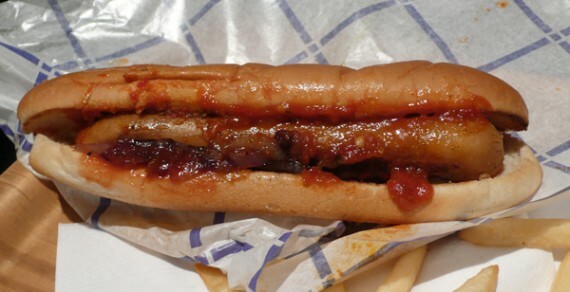 these vegan hot dogs are available in Reserved level Section 4 at the Wetzel Pretzel stand, so don’t miss them. 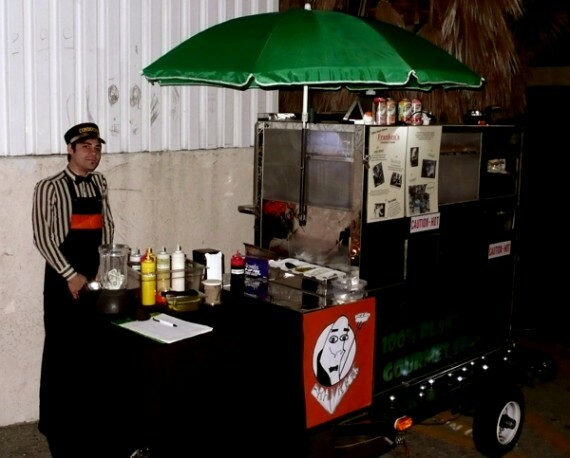 one of the concession stands selling veggie dogs! yay! for more information about vegetarian and vegan options at stadiums all around the country, check out this site called soy happy. it’s great to see so many sports arenas introducing more vegan options. if you do go see a game, you should stock up on vegan food and show support. 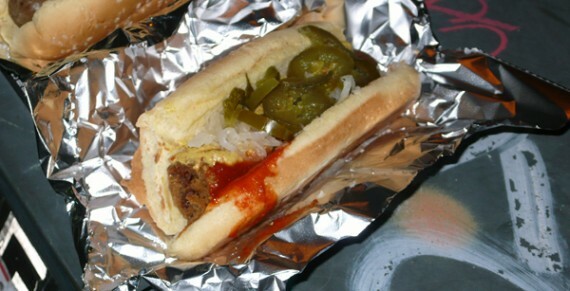 special thanks to my friend for making this vegan hot dog discovery. hopefully you will keep this post in mind next time you are watching a baseball game in LA. 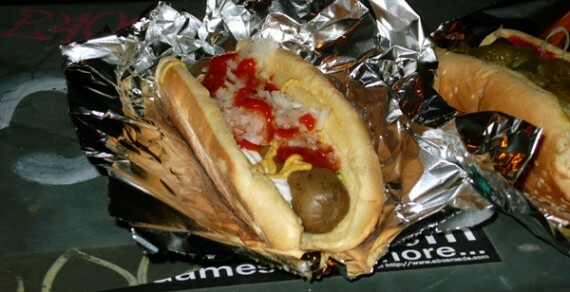 and remember, veggie dogs taste great with baseball, beer and pretty fireworks. 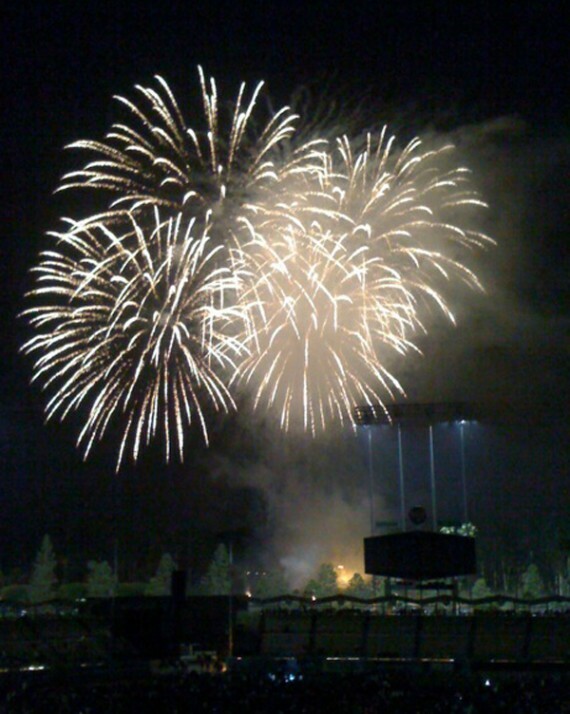 fireworks at dodgers stadium. just because. red veg! vegan fast food in brighton and london! if you find yourself in england jonesing for some fast food, you can always count on red veg. 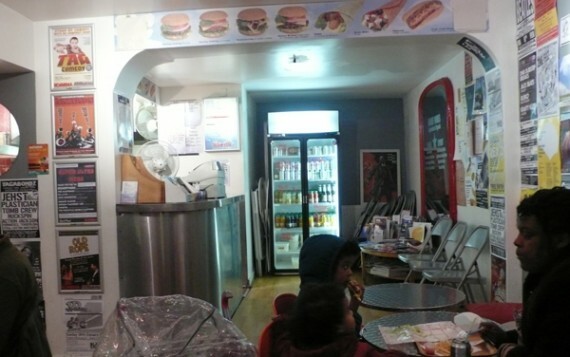 they deem their fare “proper fast food”, and they are absolutely right—the sloppy little diner has two locations, one in london’s soho and the other in brighton, and both serve up quick and tasty american-style classic burgers and hot dogs that don’t disappoint. the brightly lit interior, along with cheap tables and chairs, and food served in greasy paper sleeves make red veg feel like all the fast food joints back home in the states, with one catch…red veg is 100% vegetarian, and everything on the menu can be veganized. on our recent trip to the uk, my husband and i stayed in brighton for one night. the only evening we spent there was a rainy one, and to be honest, all we wanted to do was huddle into pubs that were located very close to our hotel. when we finally drank so much that we needed sustenance to continue, we wandered over to red veg, the closest vegan-friendly restaurant that was open after 8pm. we found ourselves in a neat little cafe full of vegan junk food…complete with punk rock posters on the wall and blaring loud music coming from tiny speakers. 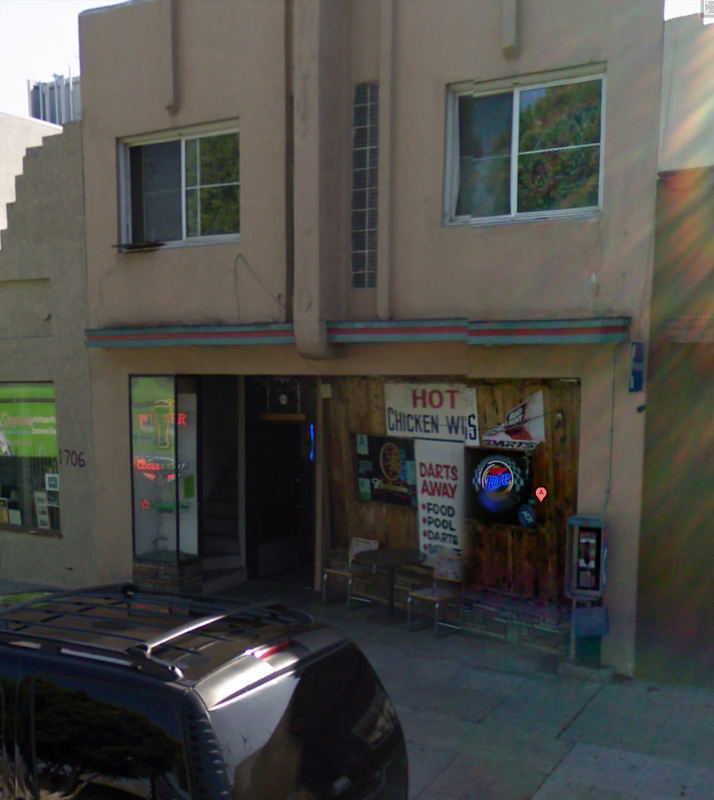 the staff was cooler-than-thou but very friendly, and most importantly very knowledgeable about veganism. my husband got the mushroom vegburger pictured above, and he absolutely loved it. it came out in record time, and was pretty cheap. i don’t remember exactly how much, but i remember it being more than reasonable. the picture doesn’t look that appetizing, i know, i know…but this is really just fast food. nothing fancy, just cheap awesome fast food…except, we can actually eat it due to the lack of dead animal bits. 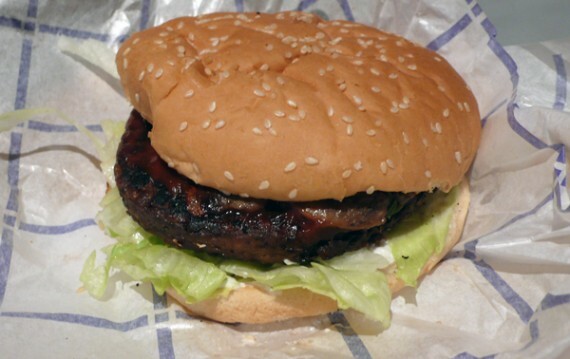 the patty was really decent, and the mushrooms were well cooked. we’d totally order this again. i went with the vegwurst and carmelized onions with loads of hot sauce. 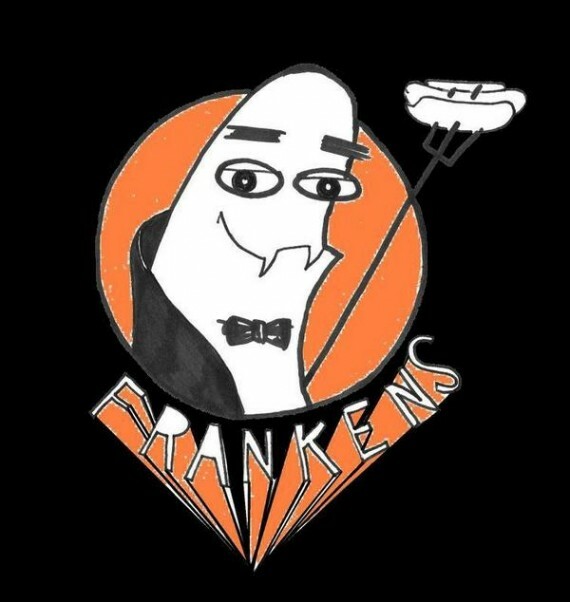 the frank was pretty small, but whatever, it tasted good. the onions were delicious and perfectly sauteed, and the hot sauce topped it all off nicely. 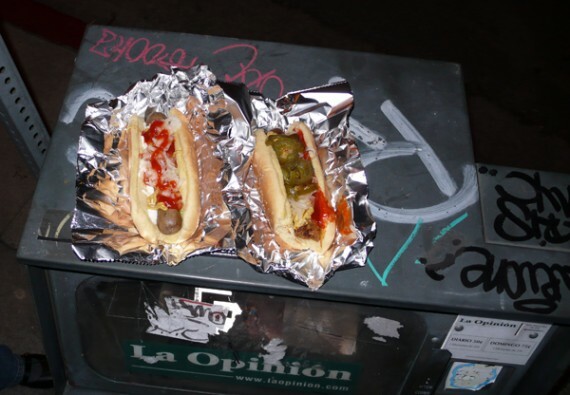 now while this dog was nothing to write home about (not everyone can be the frankenstand), it definitely filled the void and reminded me of old school fast food fare that i haven’t had in well over ten years. we topped everything off with an order of fries to split, and they were great. total thin fast food fries, red veg has got the formula down! and they even served them with a side of vegan mayo! 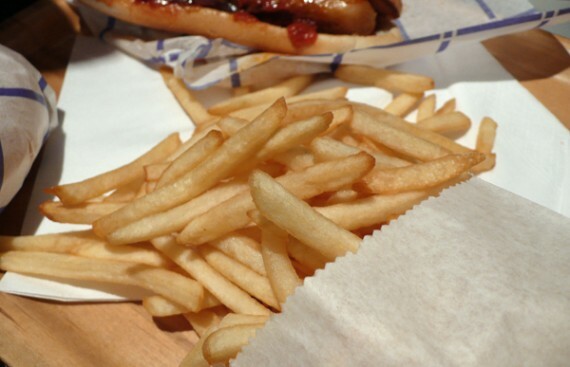 um……..mayo on my fries?!!?!?! oh, you crazy brits! 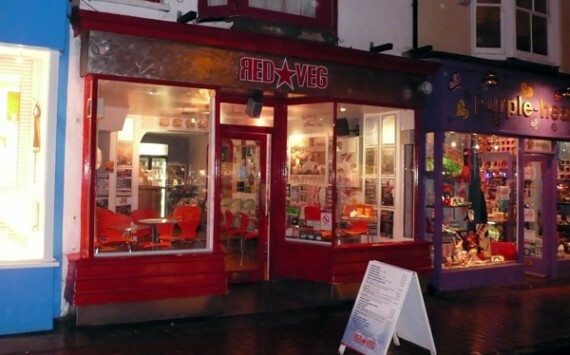 so if you find yourself in brighton on a stormy evening and need to dry off with some easy burger joint cuisine, check out red veg. they won’t let you down. i assume the london location is just as good, if not better, because it was the first one they opened. americans should definitely hit up red veg when in england. it will remind you of all the cool burger places that you can’t eat at back home. go get vegetarian fast food, it’s the way of the future!